A step by step guide that shows you how to make Instant Pot Jasmine Rice. 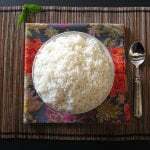 This recipe gives you perfectly cooked Jasmine rice every time, quick and easy. Rinse out Jasmine rice in a fine mesh sieve and drain. Place rice and water in Instant Pot inner pot. Stir to combine. Cook on ‘Manual’ (or 'Pressure Cook') mode for 4 minutes. Make sure steam release handle is in the 'Sealing' position. Let the rice stay in ‘Keep Warm’ mode for 10 minutes after cooking is complete. Release remaining steam to depressurize Instant Pot, or allow pressure to release naturally. Open Instant Pot and fluff rice with fork before serving. To adjust the quantities, keep the rice to water ratio of 1:1.25. Be sure to use the same cup for measuring both rice and water. * Do not overfill your pot with rice, i.e. past 1/2.